This is a great knife. I just bought my second one (custom). Highly recommended! Very well made knife from Benchmade . Looks much better in your hands than pic. Love it overall , quality blade steel running on cooper washers , like a really to be used pocket knife, big for edc but excellent for outdoors/ hunting . 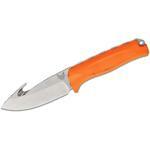 I am not a big fun of orange colors used , I like the look , but can be so easy seen in your pocket if you edc-it . 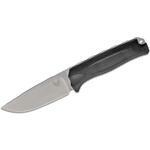 Perfect centered , no blade play , very solid and light, good ergonomics all over a 5 stars pocket knife best for hunting . I think is a bit over priced for the materials , should cost 150 bucks shipped . Lock system is super duper solid . I think this is a very successful knife from Benchmade . Thank you. 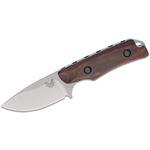 Hey, I wanted to share "Benchmade Hunt 15080-2 Crooked River Folding 4.00 inch S30V Clip Point Blade, Dymondwood Handles with Aluminum Bolsters" with you from KnifeCenter.